Faculty, staff, students and graduates from the UNC School of Social Work are joining members of the campus community calling for the removal of Silent Sam from the Chapel Hill campus. 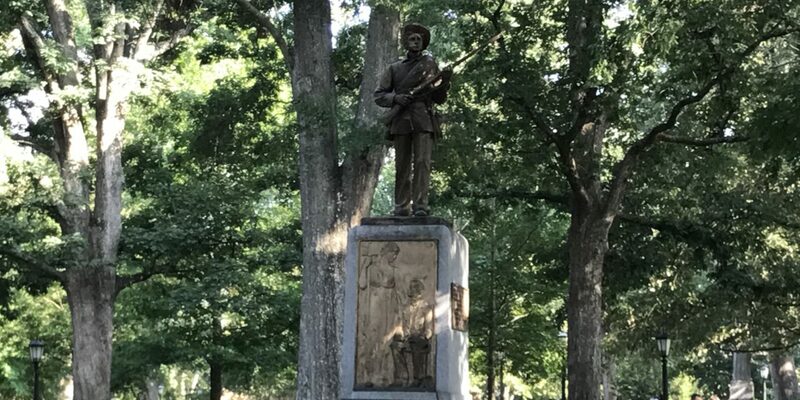 The Confederate monument that stands in McCorkle Place has been a target of protests throughout the semester after a white supremacist rally in Charlottesville, Virginia, where a counterprotester was killed. “Whatever else the memorial may symbolize to some, it was erected to glorify White people in the South, and, by extension, to carry on the subjugation of Black people,” the social work community wrote in a statement this week. “Its presence continues to legitimize and incite violence, dehumanization, and oppression. Such racist symbolism is antithetical to the ethos of this vibrant, public university,” the statement continues. The UNC – Chapel Hill Board of Trustees recently held a public comment session on the statue where speakers overwhelmingly called for its removal. But the board and UNC administrators maintain the university does not have the authority to move Silent Sam. Chancellor Carol Folt has said on several occasions that she would order the statue be moved, if she felt she had the authority to do so. A 2015 law passed by the Republican-led General Assembly limits options for moving “objects of remembrance” on state property. UNC – Chapel Hill officials have maintained that any petition to the North Carolina Historical Commission requesting the removal of the statue would have to come from the UNC System Board of Governors. That body has shown no public interest in doing so at this point. Several faculty groups have issued similar calls for Silent Sam’s removal. PreviousChansky’s Notebook: Trouble at Tennessee? Leave the statue alone. Focus more on things that really matter, homeless dogs, child abuse, hungry children…..good Lord, move on people.